Frances Ball, foundress of the Irish Branch of the Institute of the Blessed Virgin Mary, was born on 9 January, 1794, into a wealthy Dublin family. Frances was a daughter of John Ball and Mabel Clare Bennet. At the age of nine years, she was sent to school at the Bar Convent, York, England, conducted by the English Ladies of the Institute of the Blessed Virgin Mary. She remained there until the death of her father in 1808 and then spent some time with her mother at home. 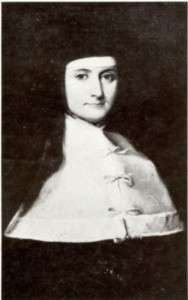 In 1814, Frances Ball returned to York and was received into the Bar Convent Novitiate at the request of Dr Daniel Murray, the Archbishop of Dublin, to be trained as a religious of the Institute of the Blessed Virgin Mary so that she could make a foundation of the order in Ireland. There she received her religious training and made her profession in 1816, taking the name of Mary Teresa. In 1821 at the request of Dr Murray, she returned to Dublin with two novices to establish a convent and school there. In 1822 she opened the first house of the Institute in Ireland, in Rathfarnham House, four miles from Dublin. She called it “Loretto House”, after the shrine in Italy where Mary Ward used to pray. The “Loretto” name was to be used for all the subsequent foundations that came from Ireland, and which resulted in the sisters of the Irish Branch of the IBVM being popularly known as “Loreto Sisters” (the spelling of which changed at the end of the nineteenth century). Mother Teresa was a woman of deep spirituality and significant administrative ability. Her energies were devoted to the establishment of many convent schools in Ireland and also in India (1842), Mauritius (1844), Gibraltar (1845), Canada (1847) and England (1851). She died at Loreto, Dalkey, on May 19th 1861. Rathfarnham South Entrance and grounds.